For two days every spring, the unlikely spot of Paso Robles becomes a pilgrimage site for fans of wines made from grape varieties from France’s Rhone Valley. 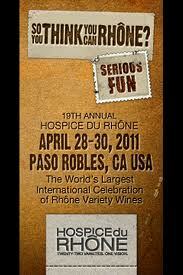 What was particularly exciting about this year’s Hospice du Rhone, the 19th annual edition, was the heavy involvement of vintners from France. Although the event always has had a smattering of winemakers from the Rhone homeland in attendance — as well as some French wines poured by importers — I can’t remember a time when so many French voices filled the Paso Robles Event Center.